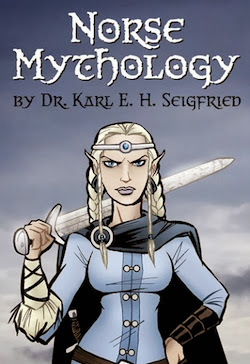 Last year, I began a new feature at The Norse Mythology Blog called "Ask a Norse Mythologist." Everyone is welcome to submit questions about Norse mythology and Norse religion through the online form. I've received messages asking about Loki from all over the USA, Canada, Turkey and the United Kingdom. I’m very glad that people of such different ages and backgrounds are curious to learn more about the Norse myths. I hope that my Loki answers will be helpful to others, or at least lead them to do further reading and research on their own. When you get right down to it, nobody knows. There is no motivation provided in the Eddas, the 13th-century Icelandic books that are the source of much of what we know about Norse mythology. The idea that literary characters have an inner psychological life is a modern concept that can’t actually be found in medieval literature. The Eddas provide no interior monologues in which the characters reflect on why they act they way they do. That being said, it’s very difficult for modern people like you and me to keep from wondering about this issue. From a contemporary perspective, you can view Loki through the lens of the nature versus nurture debate. His behavior can be explained from either end of the spectrum; just remember that we’re projecting a modern way of thinking onto ancient stories. The results say more about how we think than about how the people who created these stories may have thought. If you believe that people are born with an intrinsic predisposition to good or evil, you can read the tales of Loki from that perspective. At the beginning of mythic time, Loki is a giant. The giants are the destructive opponents of the gods, so you could say that Loki is a natural born killer. 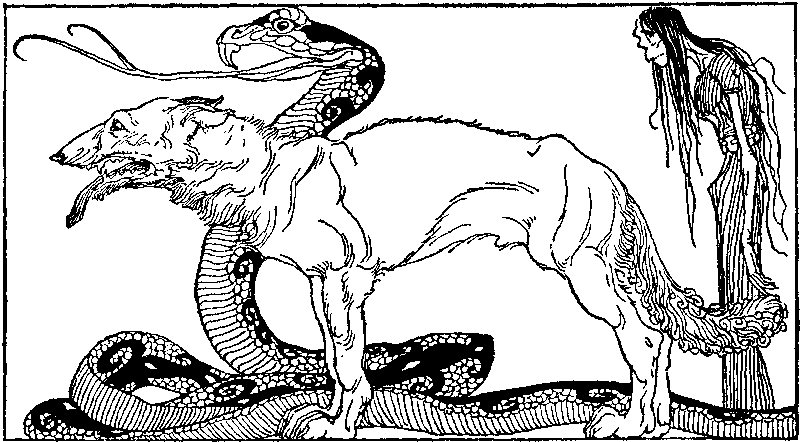 Loki fathers the most monstrous enemies of the gods: the Midgard serpent, the wolf Fenrir and the death-goddess Hel. He brings the killers of Odin and Thor into being. In the mythological present, Loki lives with the gods and is the traveling companion of Odin and Thor who continually gets them both into and out of trouble. In the future of the mythic timeline, Loki will bring about the death of the god Balder and lead the forces of darkness to destroy the world at the final battle of Ragnarök. So, you can interpret this as Loki starting out evil, striving to do good (as best he can) and finally reverting to his evil ways. According to this reading, he can’t escape his nature. On the other hand, if you believe that it is an individual’s environment and experience that determine character, you can also read the stories about Loki in that light. Some of my students have great sympathy for Loki’s monstrous children. 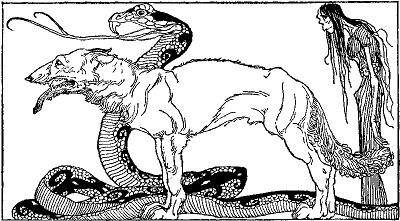 While they are still young, the gods throw the serpent into the depths of the ocean, cruelly bind the wolf and banish Hel to the world of the dead – before any of them have actually done anything to harm the gods. To modern sensibilities, it seems like this mistreatment could have driven Loki to seek revenge. In the world of the myths, however, the gods are acting to protect themselves from a prophecy that declares these three will bring about the Doom of the Gods. You can also ask if the actions of the gods actually turn Loki’s children to evil and therefore make the prophecy come true. Do the gods bring their doom upon themselves? Again, it all depends how you read the myths, but you should always be aware that we are overlaying modern concepts onto ancient tales. In order to put your mind into an ancient worldview (as much as that is actually possible), you have to realize that physical deformity was taken as a sign of evil. This led to horrible mistreatment (in real life) of people who were born with physical challenges. Even in modern times, we are often guilty of judging the character of individuals by their physical appearance. It makes no sense to suggest that long-ago gods would love and cherish children born to a giant in the form of a serpent, a wolf and a half-corpse woman. Although the monsters may seem sympathetic to modern sensibilities, that sympathy would have been completely alien to the culture that invented these stories. Myths reflect the values of the cultures that create them. That’s a very interesting question. Please check out what I wrote above to Cameron, regarding motivation. I would like to make clear that the gods are not really Loki’s family – at least not his birth family. In Snorri Sturluson’s Edda, it says that Loki is “numbered among the Æsir [the gods].” The language is important; Loki may hang out with the gods in several myths, but he is not one of them. 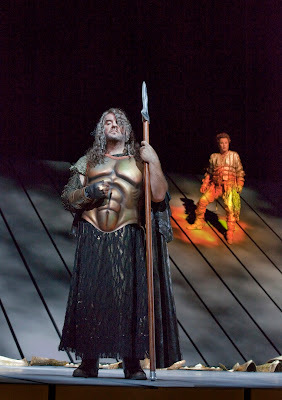 He is the son of a giant, and – in the world of the myths – kinship is reckoned through your line of fathers. 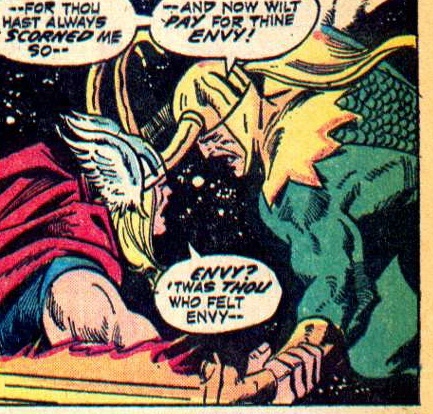 As a giant, Loki actually belongs to the family of the gods’ greatest enemies. In the end, he sides with his birth family against his adopted family. I’d also like to point out that Loki is not the adopted son of Odin; that’s an idea from Marvel Comics, not Norse mythology. We’re not talking about an adopted son attacking the man who raised and nurtured him. The myths tell us that Loki is the blood-brother of Odin. They swore allegiance, which implies that they are at least somewhat on equal terms and that they may have started as enemies on either side of the god/giant divide. Loki’s attack on the gods violates the oath of brotherhood that he took with Odin – as does his causing the murder of Balder, who actually is one of Odin’s sons. Oath-breaking and murder were (and are) very serious crimes. In Norse culture, Loki would have been seen as an outlaw; he was someone who committed crimes that meant he could no longer be part of society. Loki plays a major part in the Norse myths that have survived. These myths mainly come from two collections – the Prose Edda and the Poetic Edda, both written down in 13th-century Iceland. The oldest written source for Loki is the 9th-century Norwegian poem Haustlöng (“Autumn-long”), which includes Loki’s adventure with the giant Thjazi. There is no mention of Loki in earlier sources from continental Europe or the British Isles. 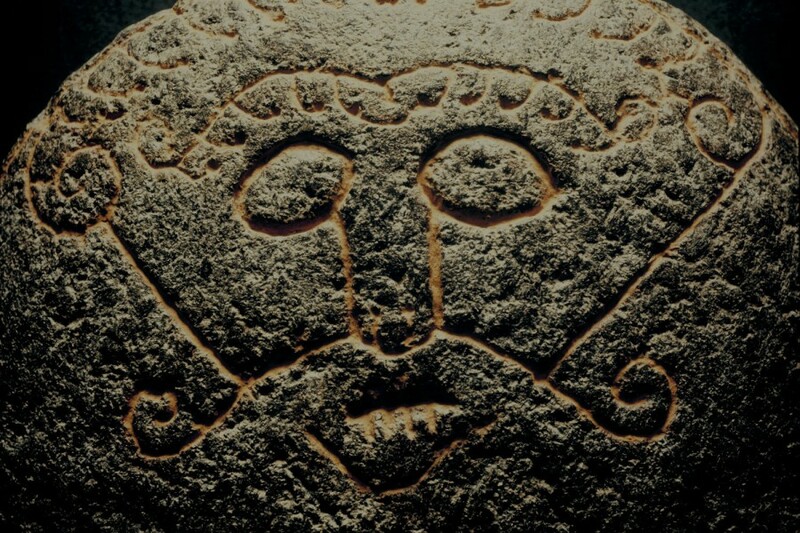 Some people have seen an image of Loki on an ancient furnace stone found on a Danish beach. Interpreting the carving this way is based on a basic misunderstanding of Loki’s nature that considers him a god of fire. Read my answer to Richard (above) for an explanation of this linguistic mistake. 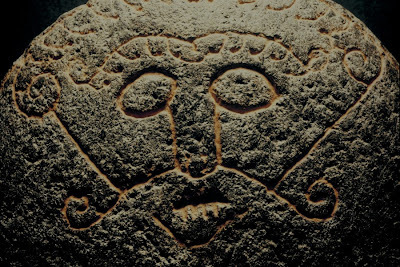 We’re left with a circular argument that (wrongly) posits Loki as a god of fire, then defines a random face on a furnace stone as Loki because he’s a god of fire. See how the logic fails? The other argument for this being Loki is that the image supposedly shows stitches on the face’s lips, as in the myth in which an angry dwarf sews Loki’s mouth shut. I think it’s pretty clear from the close-up photo that the vertical lines are simply meant to represent the face's lower teeth. Archeologists have a distressing tendency to associate with a god any representational figure that they can’t immediately explain. he was angry. Since he's always angry, I had a lot of practice. There is a carving from England that has also been interpreted as representing Loki in the form of a bound giant, waiting for Ragnarök. However, the image is actually found on a fragment of a Christian cross from the late 10th century; England’s conversion to Christianity began way back in the 6th century. Given the late date of the carving, its location and its Christian setting, it can arguably portray a devil or demon from Christian lore. The problem with interpreting this as Loki is that we’re reading backwards from Icelandic mythology and projecting it on an English artifact. 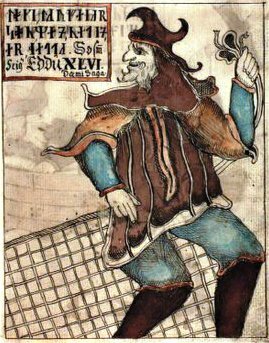 Without the Icelandic myth of Loki’s binding, there would be no reason to identify this Christian image as Loki. It’s a flawed argument, like the one for the furnace stone. 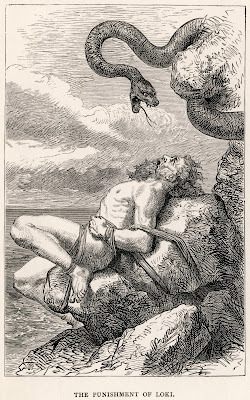 A bound Loki or a bound Satan? A different 10th-century cross from England has a figure that may be more convincingly argued as representing Loki. 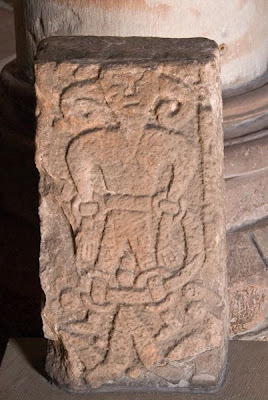 The Gosforth Cross includes an image of a bound figure lying on his back, with a woman holding a bowl above him and what may be a snake hovering above his head. This lines up well with the myth describing Loki being bound by the gods, with his wife Sigyn holding a bowl above his face to catch the venom dripping from the snake hanging above. Although we’re again dealing with a Christian crucifix, elsewhere on the object are images that seem to portray the Norse gods Balder, Heimdall and Vidar. Altogether, the cross has been interpreted as using imagery from Norse mythology to help converted heathens grasp the teachings of their new Christian faith. Again, the late date and the Christian setting of the crucifix mean that it doesn’t tell us anything about Loki that we don’t know from the Icelandic sources. As with the other English cross, we only interpret this figure as Loki because of what we know from the Icelandic manuscripts. One interesting source that may shed some light on all this is History of the Danes, composed in the 13th century by the Danish writer Saxo Grammaticus. In this massive work, the Norse gods appear in very different forms from those we're used to (which come from Icelandic literature), and the stories themselves are very different. Saxo tells us of a human hero named Thorkil who finds a bound giant when he travels to “a land that knew neither stars nor the light of day but was shrouded in everlasting night.” The story has been connected by scholars to the Edda tale of Thor’s visit to the giant Útgarða-Loki. 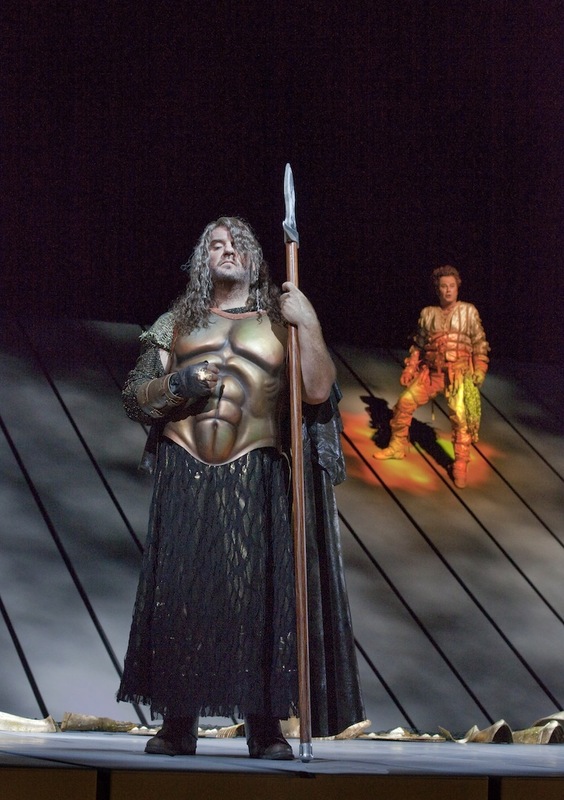 In Snorri’s version, Loki travels with Thor, and we interpret the name of the giant as “Loki of the Outer Regions.” In other words, this deceitful fellow is to the giants as Loki is to the gods; he's their Loki. After this, with others in front acting as torch-bearers, [Thorkil] squeezed his body in the narrow jaws of the cave and gazed on every side at rows of iron seats festooned with slithering serpents. Next a quiet stretch of water flowing gently over a sandy bed met his eyes. When he had crossed it, he reached a place where the floor sloped downwards rather more steeply. From here the visitors could see a murky, repulsive chamber, inside which they descried Útgarða-Loki, his hands and feet laden with a huge weight of fetters. His rank-smelling hairs were as long and tough as spears of cornel-wood. Thorkil kept one of these as a more visible proof of his labours by heaving at it with his friends till it was plucked from the chin of the unresisting figure; immediately such a powerful stench rolled over the bystanders that they had to smother their nostrils in their cloaks and could scarcely breathe. They had hardly gained the open air when the snakes flew at them from every direction and spat on them. You’ll have to read the book to find out what happens next! In this version of the myth, Útgarða-Loki seems to be Loki himself. The scholar E.O.G. Turville-Petre writes that this giant “appears to be Loki, expelled from Asgard [land of the gods] into Utgard [land of the giants], in the form which he took after he had caused the murder of Baldr. He was bound with fetters, and thus he will remain until the Ragnarök.” Note that this giant is bound underground and guarded by poison-spitting snakes, which agrees with the punishment of Loki that we’re familiar with. It also lines up with the image of the bound giant on the cross discussed above, if we decide to interpret that image as a bound giant. As I wrote earlier, some scholars have argued that this idea of Loki as a bound giant is the older version of the character. I hope you now see how difficult it is to move between physical artifacts and literary sources and argue the meaning of one based on the other. In the end, the answer to your question is really that the only definitive things we know about Loki come from late literary sources, either from the time of northern Christian conversion or long after that conversion was completed. There is a lot of scholarship on this issue, and I've merely addressed some of the basic issues here. Very nice. I'm looking forward to the other parts. The group I worship with has open meetings, and newcomers frequently want to talk about Loki. It's honestly a little tiresome, and it'll be great to have your blog as a well-researched resource to point them toward. I agree wholeheartedly with your statement "Archeologists have a distressing tendency to associate with a god any representational figure that they can’t immediately explain." I've said very similar things to others in our group on more than one occasion. Having said that, though, I've always thought the Snaptun forge stone was intended to represent Loki after Brokk sews his lips. My own interpretation of the stone is informed in part by Judith Jesch's "The Norse Gods in England and the Isle of Man," and I believe the stone may reflect a local survival of some version of the myth. Rather than see it as a representation of Loki as god of fire, however, I think it could just be a picture of something from the mythology that the smith could perhaps identify with or enjoyed. The story does after all portray a contest of crafters and a smith getting some measure of payment from or revenge on someone who tried to cheat him. The smith's possession of such a thing doesn't necessarily mean he would have been a worshiper of Loki or a Heathen of any kind. Loki is not the god of fire but his connection to fire definetely are there in the myths. According to Dumezil wind and fire are his psychological elements. The fire element in his myths are many: his battle with the same weapons as Logi, the hellfire that burned down Aegirs hall was Lokis work, inflamed by one word of him, and last not least the Lokabrenna, the icelandic word for dog days heat derive from him - all that can not be denied. And one word about physical handicaps in the heathen world of Northern Europe: we can not deny for reasons of political correctness that any form of physical handicap was defintely regarded as absence of hail (Heil) from the gods. Like I write in the article, we need to be careful about projecting modern concepts (like "psychological elements") backwards onto the source materials. The connection of Loki to wind comes from his alternate name Loptr, which can be interpreted as "the airy one." The connection to fire is, as mentioned in the article, a mistake based on a linguistic misinterpretation. In neither case does psychology enter into the equation. Loki's interaction with Logi ("fire") is not a battle with weapons (fire or otherwise), but an eating contest. The story is actually a riddle based on a pun (Loki/Logi) and, if anything, shows that Loki is not fire. There is no such thing as "hellfire" in Norse myth. This is a Christian concept. The Norse Hel is cold and damp, not hot and fiery. Loki does not burn down Aegir's hall; he merely threatens to do so as he fearfully flees from the threats of Thor. There is no suggestion that Loki has some sort of magic-word power. He's merely threatening to do what (human) characters in the sagas do - burn down the hall of an enemy. As for "Lokabrenna," I have yet to see any occurrence of this term predating the 18th century, after the Edda began appearing in published form. Unless you can find verifiable pre-Christian (i.e., before 1000 CE) attestations, we'll have to assume this term owes more to antiquarian interest or post-Christian folklore. I'm so glad you talked about the God of Fire misunderstanding -- I never could wrap my head around why people clung to this idea, because if Loki HAD been the god of fire, why on earth would he have lost that race against wildfire?! And how could he have been deceived, for that matter? It just didn't hold up to the story itself. I posted on my blog, too, about Loki as a blood-brother of Odin, and how that might affect his relationship to Thor. I think the dynamic of "Cool Uncle Loki" is WAY more interesting than the "adopted brother" thing that Marvel went with. Am I off my head here or was there astory where Angrboda was actually Loki in disguise? And was Sigyn his.first or second wife? You're probably thinking of the bit in Lokasenna where Odin says to Loki, "yet eight winters you were, beneath the earth, | a woman milking cows, | and there you bore children." You may also be thinking of the end of Baldrs Draumar, when Odin says to the undead seeress, "You are not a prophetess nor a wise woman, | rather you're the mother of three ogres." I would probably think of Angrboða as Loki's mistress and Sigyn as his wife, myself. In Benjamin Thorpe's Northern Mythology. He has Loki down on Midgard. In the shape of a cow. When a piece of Gullveig's thrice burnt heart falls to Midgard. And Loki and eats it by mistake while grazing. From then on he slowly turn evil. The eating of a woman's roasted heart by Loki comes from "Hyndluljóð" (Song of Hyndla), stanza 41, but nothing of what Thorpe said is mentioned in it, and the episode isn't mentioned anywhere else in the sources. Basically he just pulled it out of his backside. so Loki and Logi are two different Gods but Loki can posses fire and control it? i am trying to understand due to an amine im watching, they refer to Loki as the god of fire not as the god of mischief as marvel portrays him. so im just all kinds of confused. Are they confusing Loki with Logi or not?? Loki and Logi are two different characters in Norse mythology. Check out the answer to the first question in the article above, which addresses this common confusion. I hope it helps! Is there an astrological connection? The Gods/Goddesses of much of the ancient world were almost certainly astrologically based. Is Odin the same "God" as Saturn, also known as Chronos etc Is Thor the same as Jupiter also known as Zeus? 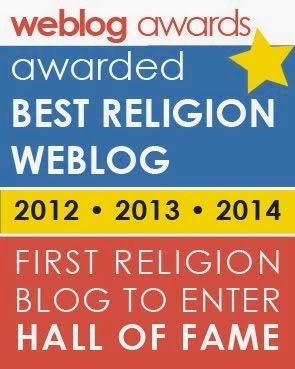 These "Gods" are planets and much of religion/myth is metaphorical story for astrology. Please correct me if you think my assumptions are wrong. Thanks. M.
I just don't believe in Loki. I just don't see it. I am curious. Rooting off the concept that no one worships him, therefore he is not a god of anything, what true purpose does this being serve? This universe is so big, he has to have some kind of role in the hierarchy of this complex era he spawns from. Based on his role in the sagas, that he's born into a race that's defined almost entirely by chaos and destruction,and that he iniates Ragnarok, I'd say, more than anything, he would play the role of an antagonist. Some modern pagans choose the Jottun and monsters as their deities, and for for their mainly antagonistic role this is controversial if not more than just controversial. From what I know, probably not for the Germanic people. The only connection they had with planets were the Anglo-Saxon gods in relation to the English names of the week. For example, Wotan (Odin) was worshiped on Wednesday. Otherwise it had nothing to do with astrology, unless I'm mistaken. To a small extent, gods were associated with planets and celestial bodies in occultism, but that was only Classical, Amerindian, and Eastern religions. Almost all of that was developed during the Christian and secular era except for Amerindian paganism.